At the age of 85 when most lawyers call it quits, Advocate Lily Thomas is actively pursuing justice. She is one of the few lawyers who marched along with the Indian Supreme Court. She recently appeared as a petitioner in a PIL that has left political parties in a quandary and media houses hailing her as savior of democracy. She looked ecstatic after SC delivered a judgment having far reaching consequences, it provided for disqualification of MP’s, MLA’s on the date of conviction. 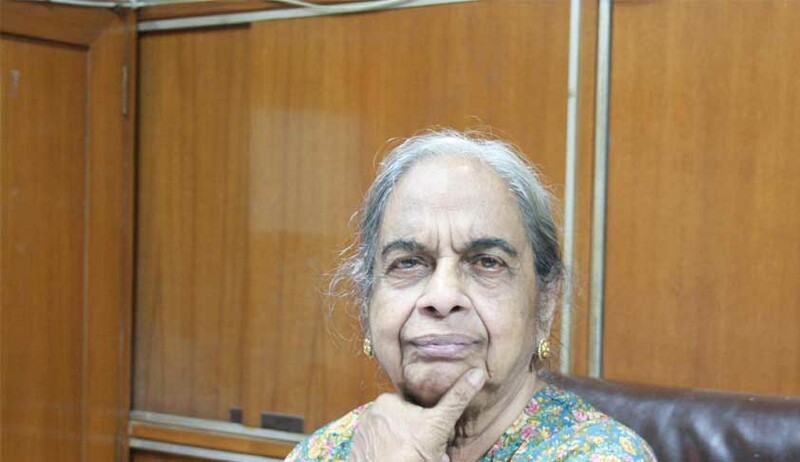 She belongs to the first generation of women lawyers in India and is the first woman to hold a Master’s degree in law from Madras University in the year 1960. She completed her LL.B. also from the Madras University in 1954. In a candid interview with the Live Law’s Associate Editor, Esha Saha, she took a stroll down the memory lane and shared both behind and inside the court room experiences with us. Live Law: First of all, congratulations on your recent success. Although, the judgment will help a great deal in decriminalizing Indian politics but do you think that there is a lacuna in the judgment with regard to the question as to what happens to the disqualified legislator when he secures acquittal from a higher court? There seems to be no provision in the SC judgment that provides for the reinstatement of the disqualified legislator once acquitted by a higher court. Lily Thomas: This is an individual problem. On conviction of the legislator, he becomes disqualified and his seat will lie vacant and there is no question of reinstatement of the disqualified legislator. This is a landmark judgment that speaks for itself. The disqualification cannot be revived. Live Law: Recently, the Supreme Court admitted two petitions that challenge the prevalence of Advocate on Record designation in the Supreme Court; a year after the same was dismissed by the Delhi High Court. What is your opinion on the system of having Advocate on Record (AOR) examination which has been a subject of controversy since its very inception in 1964? Lily Thomas: The court does not have the power to subject the advocates to this exam. Section 30 which is under Part IV of the Advocates Act provides that all advocates have the right to practice in all Courts across the country, including the Supreme Court, and that no restriction could be imposed in this regard. However, Courts have persistently held that Section 30 must be read with rule 52 of the SC rules which preserve the SC’s power to lay down rules under Article 145 of the constitution. The Court placed the system of having AOR examination relying on this and in the process completely ignored both Section 30 and Section 16 of the Advocates Act which doesn’t speak of any AOR designation and simply classifies advocates into Advocates and Senior Advocates. I was one of the first lawyers to challenge this system. While arguing in the court, I was told by the judge that even with half the effort I can pass the exam but be that as it may, the court does not have the power to subject the advocates to this exam. Live Law: I have been informed that you take deep interest in comparative study of religions, do you think in a country like ours Uniform Civil Code can be in place? Lily Thomas: We already have a Uniform Civil Code in place; it is just not referred to as a Uniform Civil Code. A Uniform Civil Code is a procedural law which is concerned with administration of justice. We don’t have to prescribe to western civilization’s idea of Uniform Civil Code. Need for more uniformity is not required. Muslims can have their own laws. I don’t find any problem with our system except for triple talaq and polygamy. Live Law: Then how do we address “Triple Talaq and Polygamy” without offending the minority sentiment? Lily Thomas: Well, that’s what I am thinking about. Live Law: There is a feeling among some of the lawyers that there is no proper forum in place to address their grievances against intemperate attitude of some of the judges to a proper authority and seek solution for the same. Your comment on this issue? Lily Thomas: It is true that people of stature do not take interest in the activities of the Bar Council. In a matter like this, the President of the Bar Council must organize a committee of senior people in-house manner to address the grievances of the lawyers to the Chief Justice and respective judges. The procedure should take place without any record as nobody should come under the scrutiny of RTI. Keep in mind that judges should not be criticized publicly. Our faith in the court is part of a myth, don’t destroy the myth. Live Law: Do you feel there is an area where either the lawyers or the judges should try to improve on? Lily Thomas: We should give more attention to pleadings. Most SLP’s are badly drafted. You can’t expect a judge to sift through ocean of pages to figure out what the real issues are. It is extremely important that issues are carefully drafted and pointed out to the judge. It is only in reasoning that you can make a judge accountable. Therefore, it is pertinent to have a well drafted SLP which is lucid enough for a judge to understand and of course, there should be some reasoning while disposing the SLP. If there are specific points raised, it is easy for the judge to disagree and dismiss or allow. Another important area is the style of judgments appealed against. The volumes are written by the judges making the Appellate Court’s task very difficult. Live Law: Why don’t you tell us something about your esteemed colleagues, judges you admire and also, the kind of relationship you share with them? Lily Thomas: Well, there are many wonderful personalities. To name few, Justice Bhagwati and Setalvad were extremely good legalists. They were like masters of court who were in complete control of the situation. Then there is Fali S Nariman whom I admire a great deal. Once I confided in one of the judges and told him that not only Mr. Nariman is handsome and has a good voice but he has also got a solid head. The judge asked me not to be foolish and said what Mr. Nariman has is not a solid but a sound head. Most of my colleagues have a good sense of humour. Once at a party I refused to accept a cocktail offered by Advocate R K Garg. He did not take offence rather asked me “how can I be a bar maiden if I don’t accept a cocktail”. Live Law: So, there was never ever a skirmish situation between you and your colleagues? Lily Thomas: No. Though, at one point of time, I used to feel extremely jealous of women lawyers who got promoted to higher ranks of Judiciary. I thought that the reason these women were getting promoted was not because they were qualified but because they were either the niece or daughter of the Law minister. Being the first woman to hold a Master’s Degree in Law, it was hard for me to digest that I wasn’t considered for the position of Judge. My colleagues asked me not to bother about it and in fact, told me that they too were jealous of me because I was able to secure orders against stalwarts like Senior Advocate Ashok Sen. It was, however, Advocate Khanduja who cured me of my jealousy. He quite rightly said that we are only jealous of friends and relatives and not strangers. That’s the day my jealousy got cured. Live Law: You belong to the first generation of women lawyers in this country. Was it tough for women in those days to make it in this profession? Did you ever experience any kind of discrimination in this field? Lily Thomas: Not at all. Boldness is the indispensable disposition and quality for women lawyers. Study of law is an extremely liberating and strengthening experience. It helps in personality development. I remember, Justice Desai once asked me in the court room, “Madam Counsel, are you Miss or Mrs.? I quickly replied, “I am a miss, no doubt, but I don’t miss much”. The entire court room broke into laughter. Also, I am not in the habit of complaining about everything. My brother always taught me one thing i.e. “do not unnecessarily take offence and complain about men, colleagues and put others in a difficult situation”. Life is free. Nobody should offensively touch you but rest you must learn to manage. Live Law: On a lighter note, how is it that you never got married? Lily Thomas: Oh! Justice Fazal Ali once asked me the same question. My reply was that most men I was interested in, have either become a judge or priest. Anyhow on a serious note, I have never been able to find a man who is James Bond, Abraham Lincoln and Winston Churchill, all rolled into one.